I have been putting these fliers everywhere in hopes to find students that will benefit from personal art instruction. Down below are a few different jobs I had teaching art. 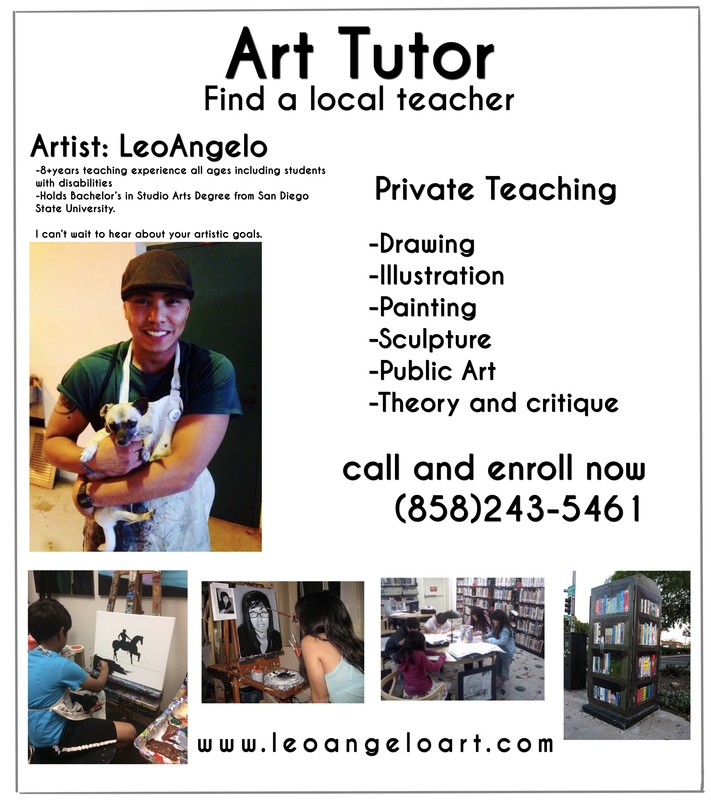 I have taught many private art lessons over the years and I have taken teaching classes at San Diego State University. I have done some teaching at the Museum School near Balboa Park and many other in-home lessons. Try me out, you will learn a lot. 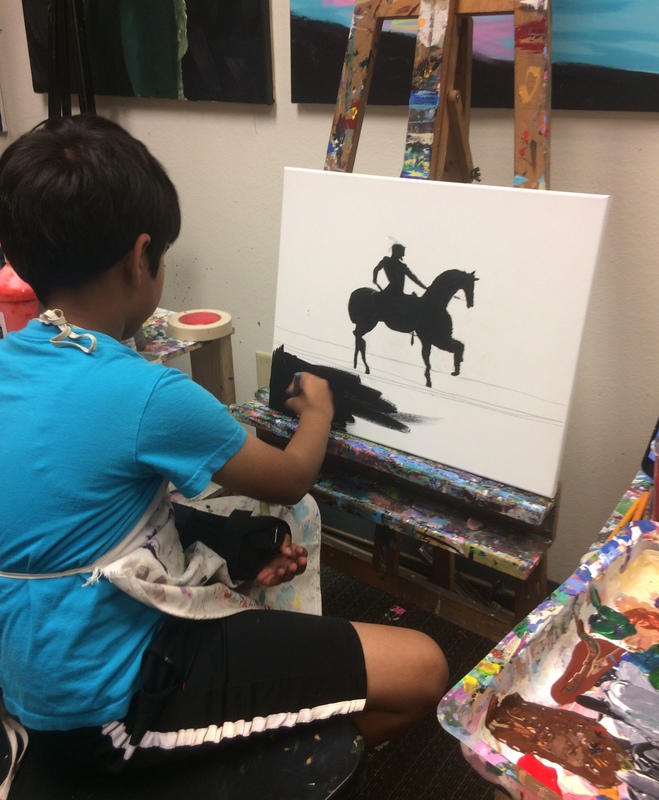 We can do a painting from a reference from start to finish as I give helpful techniques and we can do hourly sessions like music lessons. I do in-home lessons mine (Mira Mesa) or yours. We can also go to the local library or coffee shop, I’m adjustable. 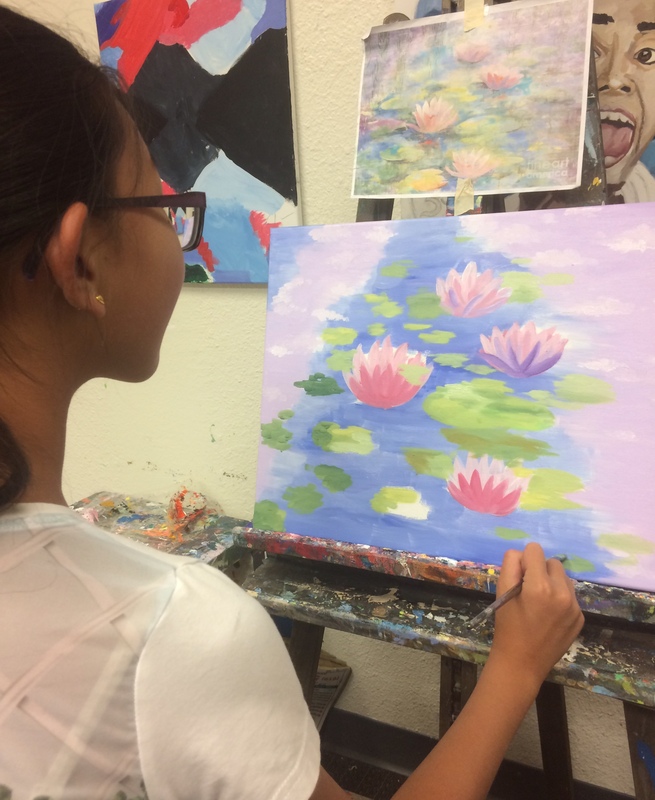 This link is to a post of my student’s progress in painting with oil paint for the first time. Anyone can paint if they have the desire. I taught this young woman how to paint her own portrait by observing values and points of references to get her likeness right. 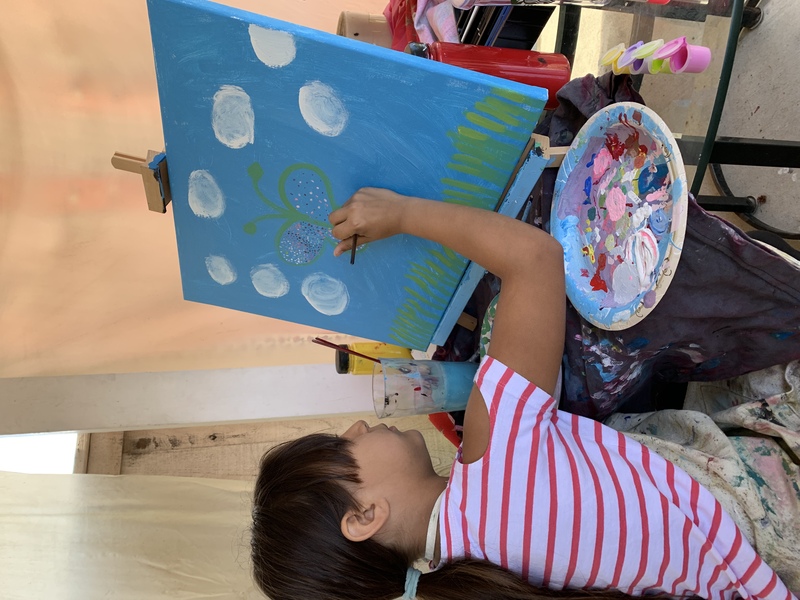 I worked with children for a few years while I was studying in school and I found that the best way to get them to do art is for them to create things of their interest. 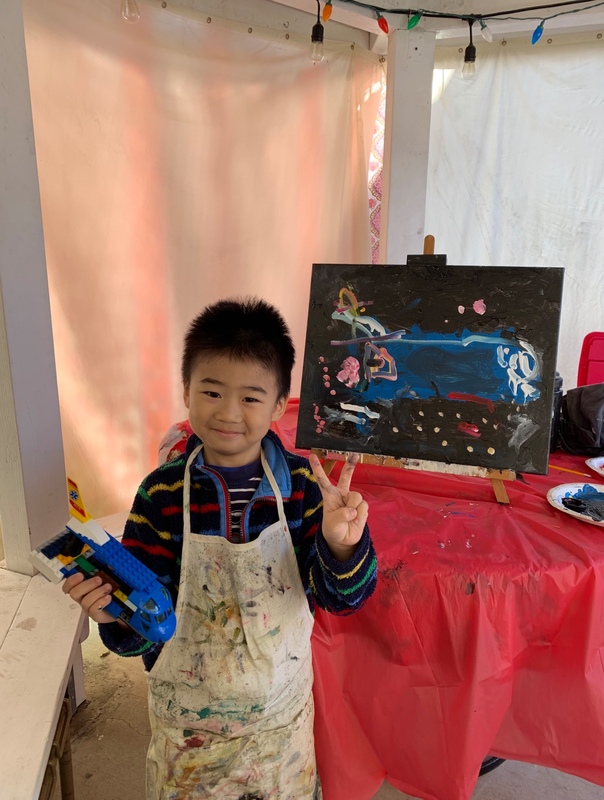 I learned that by conversing with them and relating what they like I am able to encourage a child’s creativity while teaching them some solid technical skills. This project was to beautify a sad stump with chalk and the children seemed enthralled at transforming the stump. More children came and wanted to help and we created a unique and strange new object. 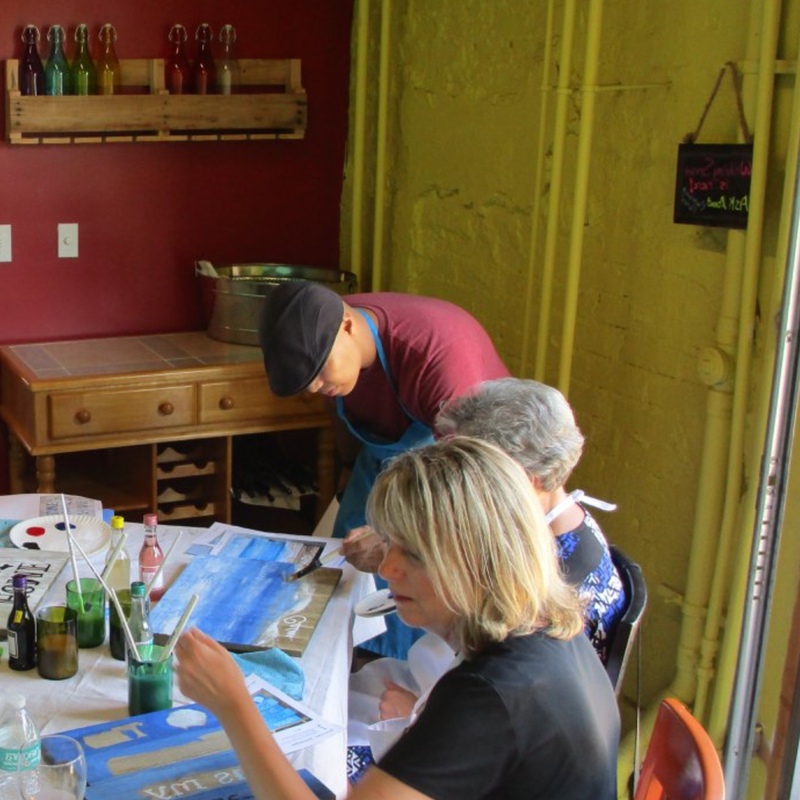 Art can be fun, transformative, and expressive. 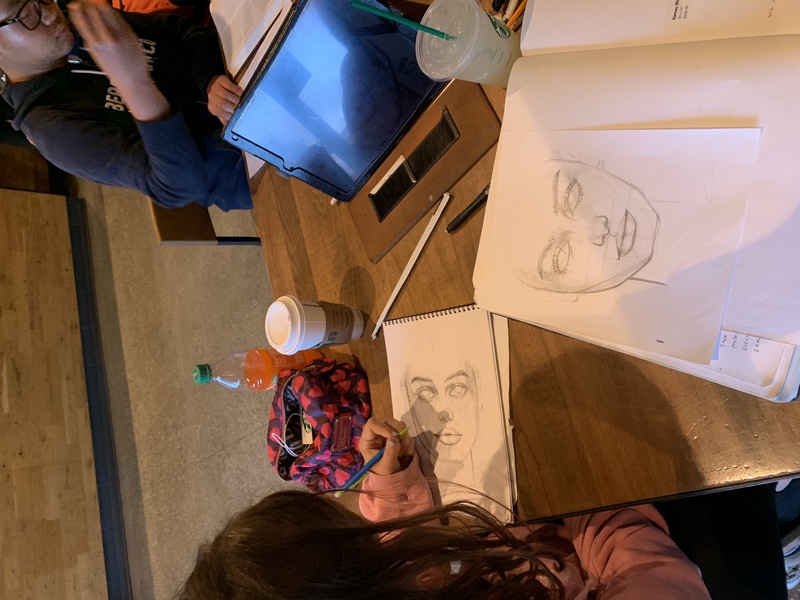 I have already directed students for public art projects and that is one of the other exciting lessons I will have with my intermediate students. 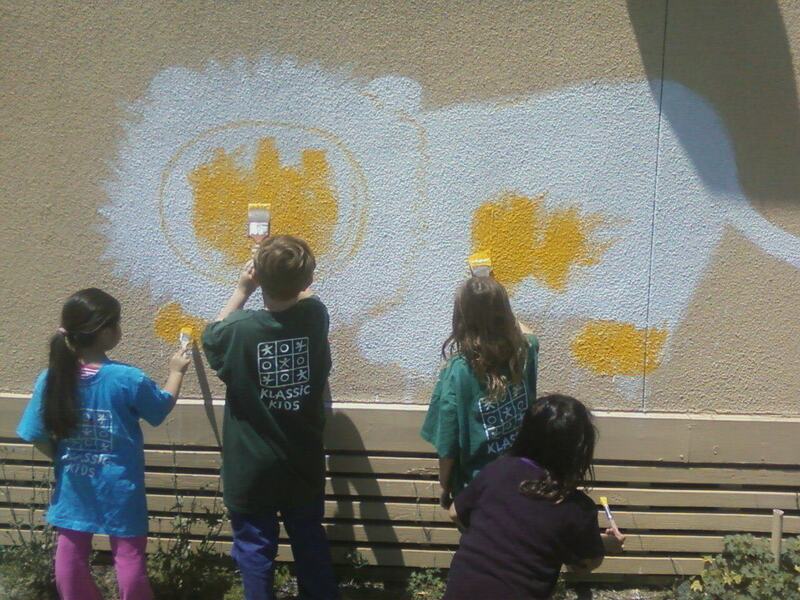 Some of my kids here helped me make murals at Mason Elementary. 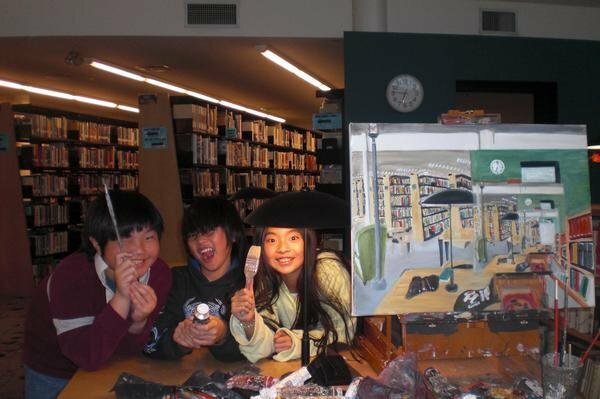 In the library I was able to teach children some basic art skills and plus they were a fun and funny group. I think besides the teaching of technique I am able to get in my student’s point of view which only helps enhance the learning and desire to learn. 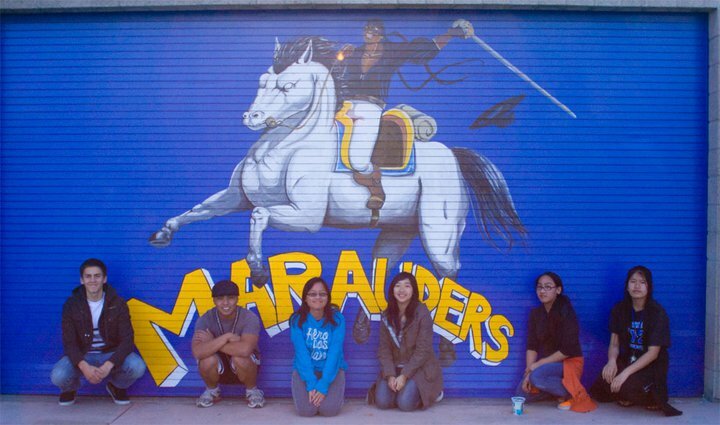 I recruited a few students to work on this mural which took a few visits during their lunch time. 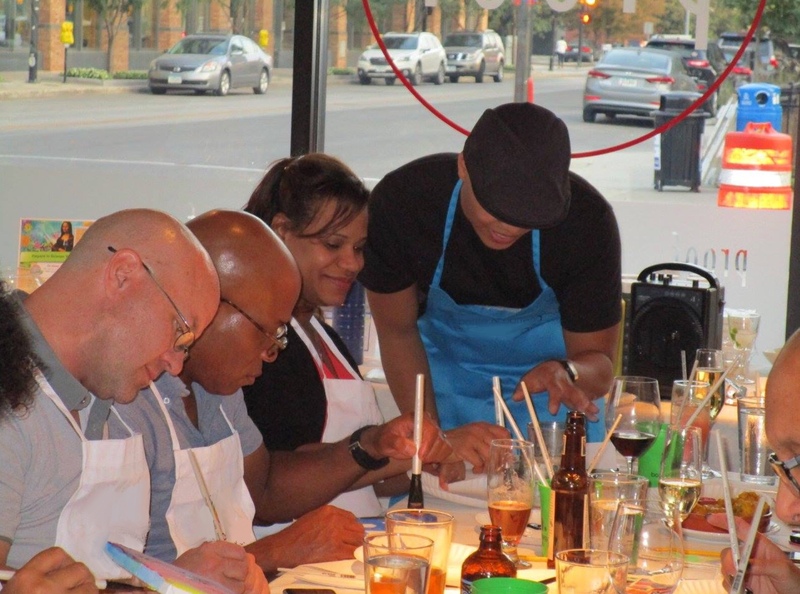 I worked at Bottle and Bottega’s studio where I taught people how to paint an image from start to finish. Simple two hour classes can yield beautiful results even without experience. 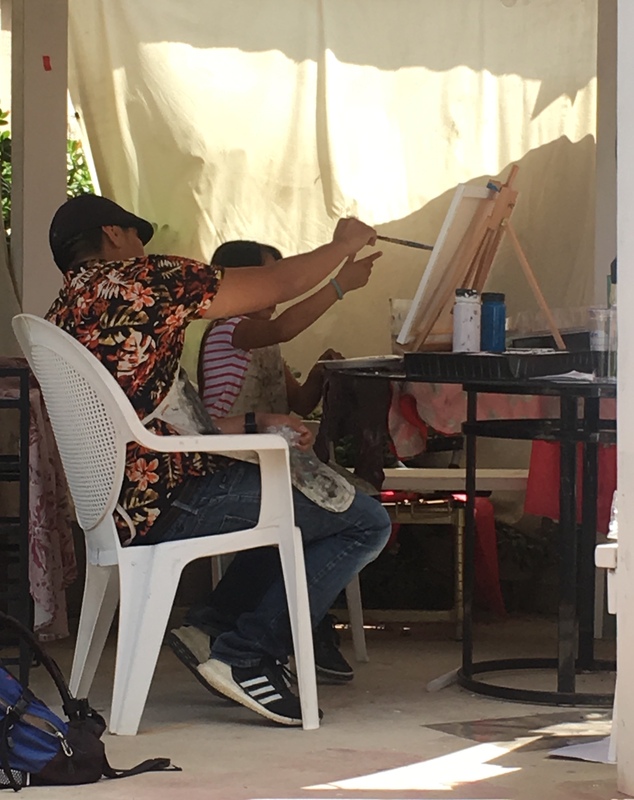 It’s been a real great privilege working as a painting teacher for the San Diego Music and Arts Cooperative for my little workcation back home. 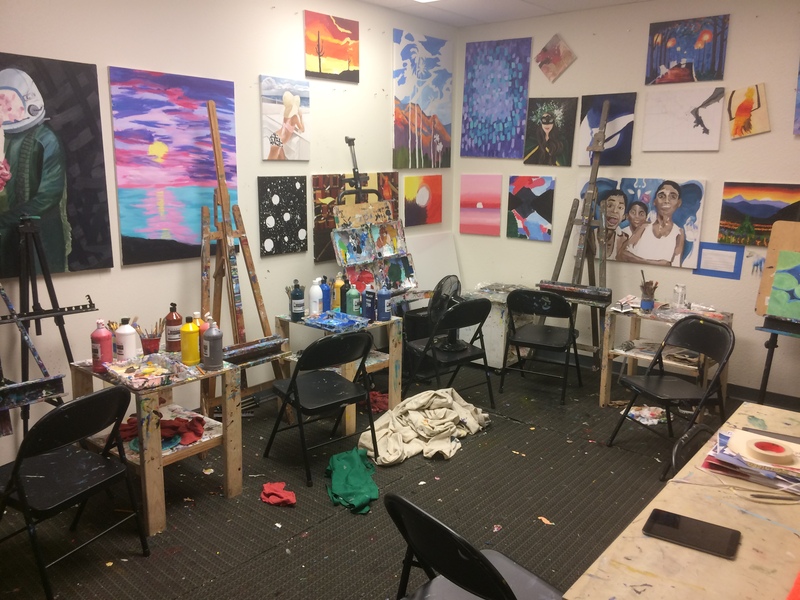 It’s heartening to see the passion of diverse young artists around the area and the hours and energy they put into their work. 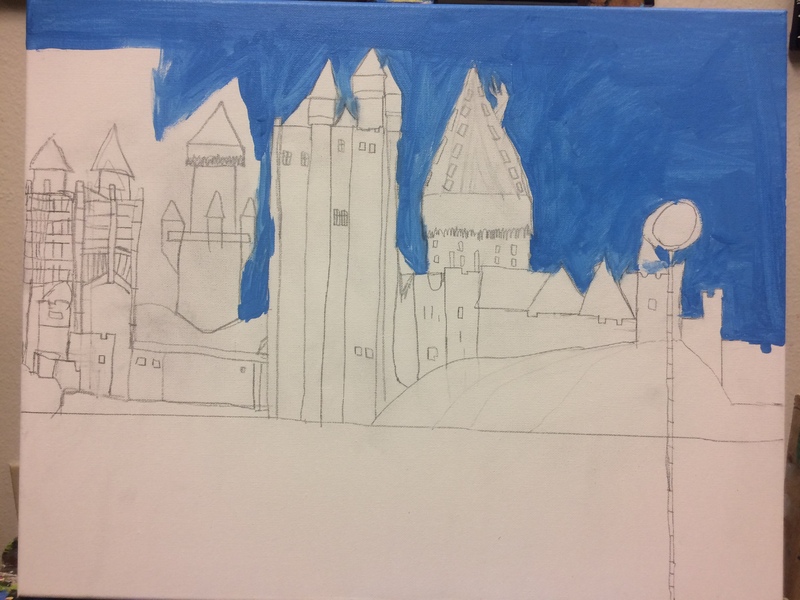 Here my student had an idea of what he wanted to paint for a competition. I just helped him break down the steps in painting so that there is less error and more trial. This is an in progress of a student’s work. 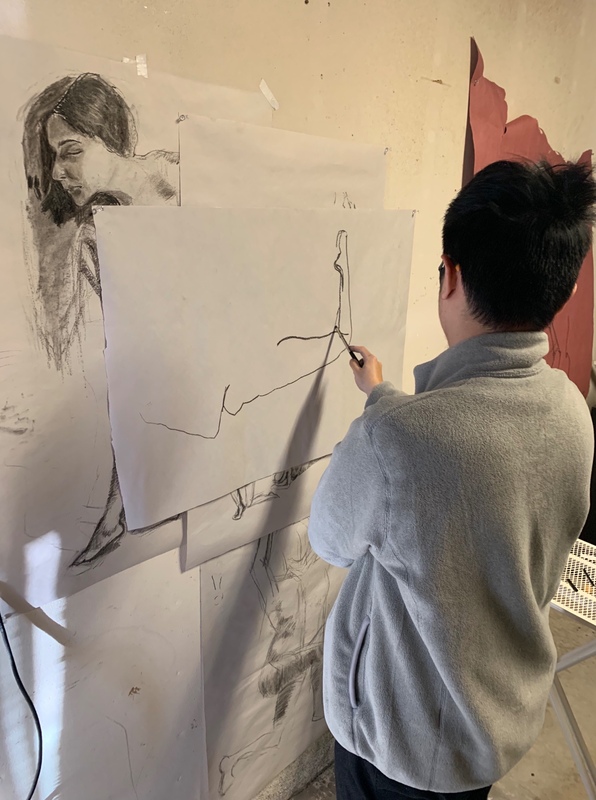 Although my student is really young I love the patience and confidence that he is exhibiting and the challenge of such a detailed painting that one can see even in the under drawing. 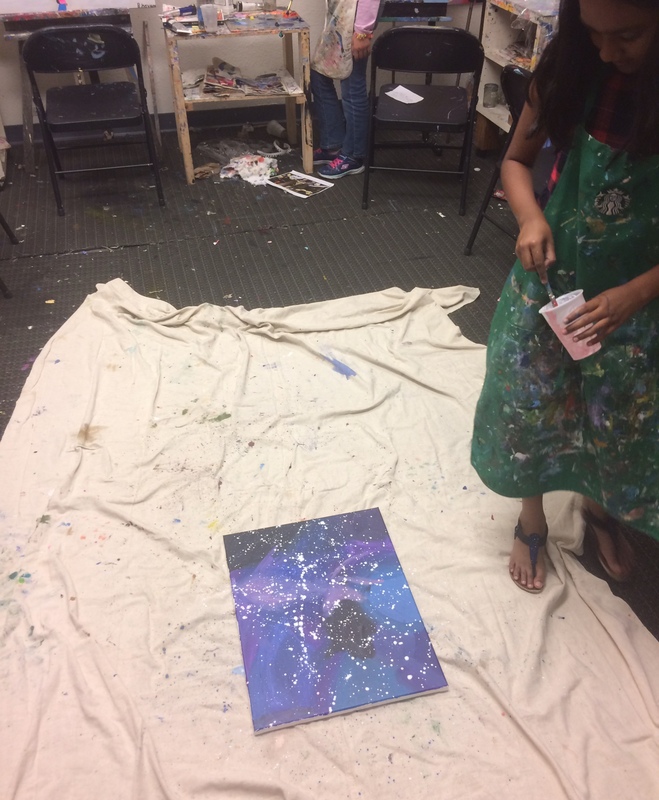 My student here is employing a more expressive technique inspired by Jackson Pollock to develop her stars in her universe. 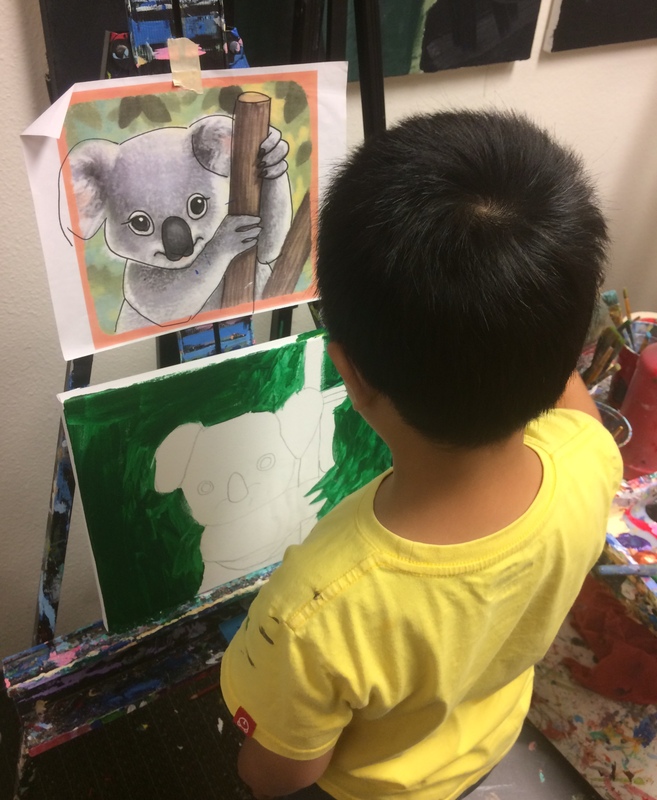 Here my young student is building some early motor skills and is understanding how to draw and paint by using simple shapes. 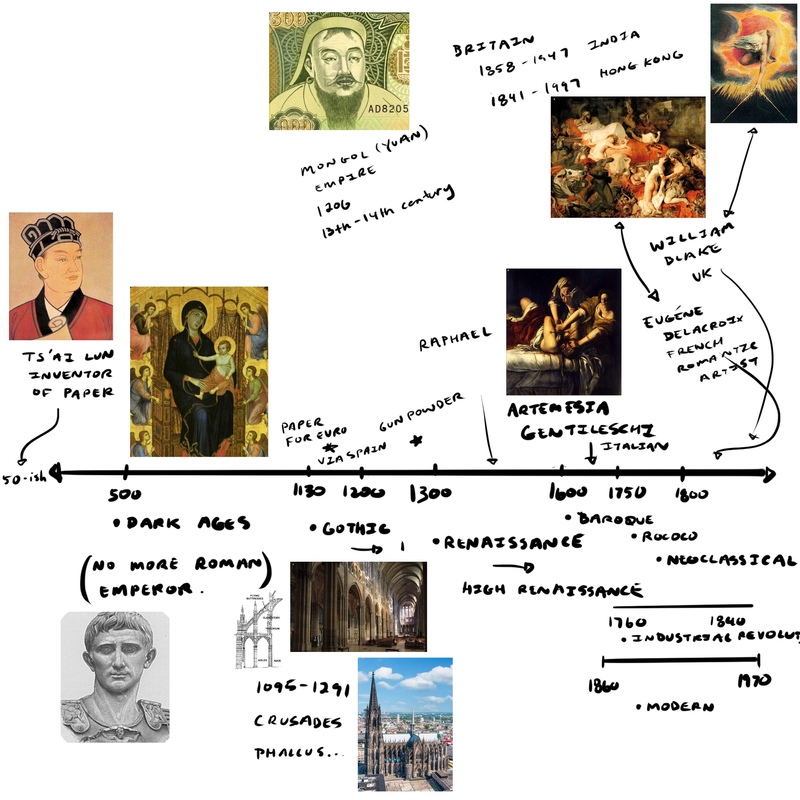 This is a visual aid I created to discuss theories and art movements that one of my students was interested about. I like to bring history to play to relate to current issues in contemporary times. 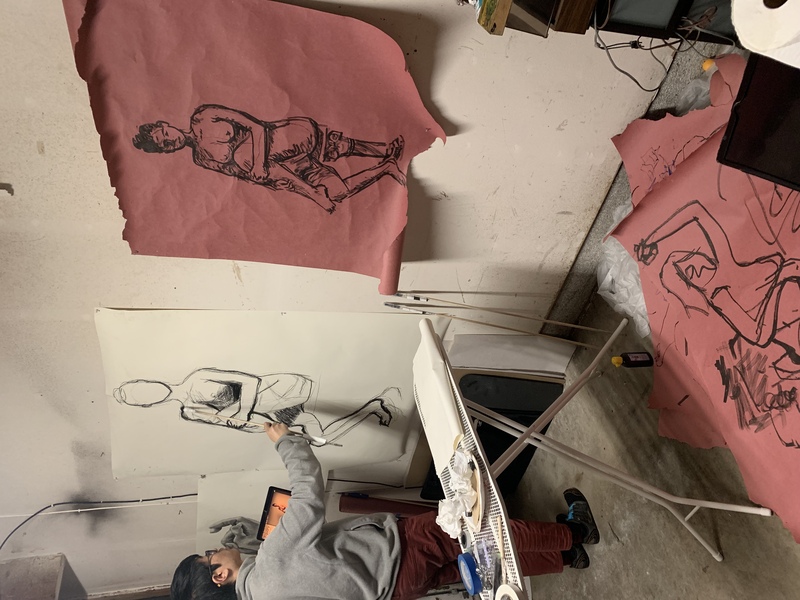 My student is practicing his proportions by studying the figure. 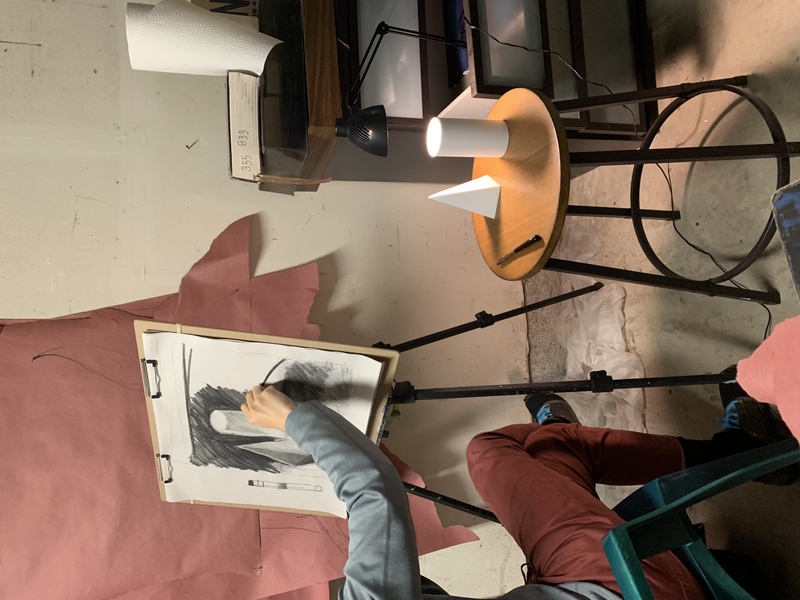 Here he is employing continuous contour line drawing to better observe the figure and to enhance his mark making. We have been approaching the figure with different methods and perspectives to enhance our understanding and to build up our foundations. My student here is taking me for illustration and we are developing our skills to create a story. We are starting with simple shapes to break down our subject first as a foundational way to add to our overall knowledge of it as we will be drawing it many times for her project. I made this visual aid to show her how we can draw in steps. 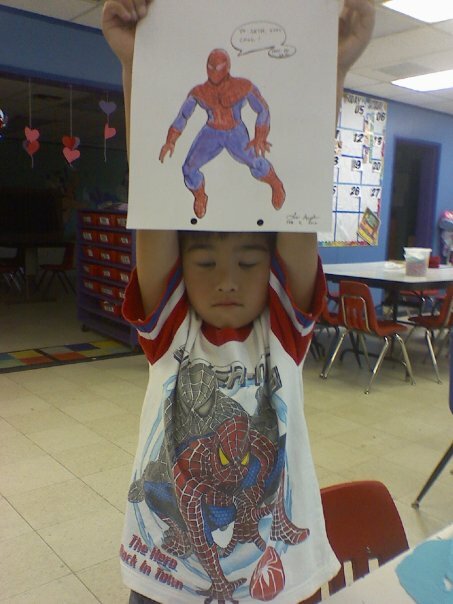 This is my painting student and he is four years old. He loves rocket ships and has an abundance of energy. 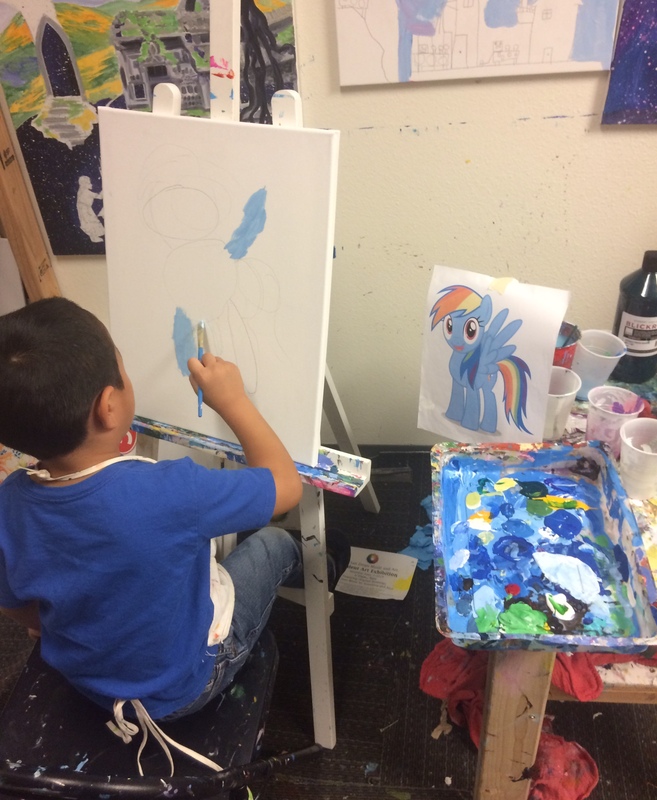 I help navigate his energies by teaching him good behaviors and manners while we paint and learn art techniques. The art here is a device to keep his interest and build his focus. This is my student who is employing a pointillist technique. 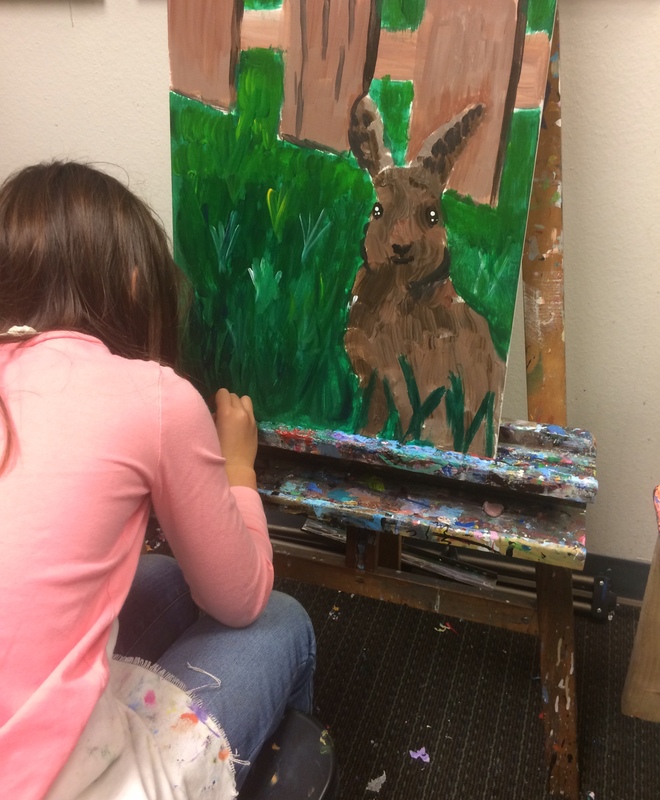 This is her first canvas painting and I am giving her helpful techniques and communicating with her the whole time we are having a session. Besides tips I also encourage my students to insure the most successful painting for their ability. 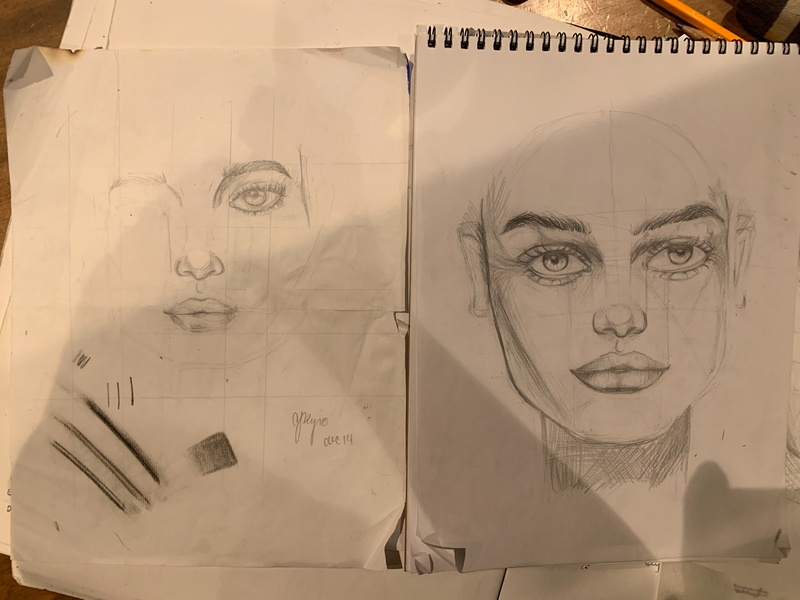 My student here was ambitious and wanted to better her proportions of the face so we practiced a portrait together. I broke down the image with her to better her knowledge of the face. Her drawing before is on the left and the one on the right is hers while drawing with me. Pretty good for fourteen years old! I am knowledgeable in many areas of visual expression, from drawing and painting to illustration and sculpture. 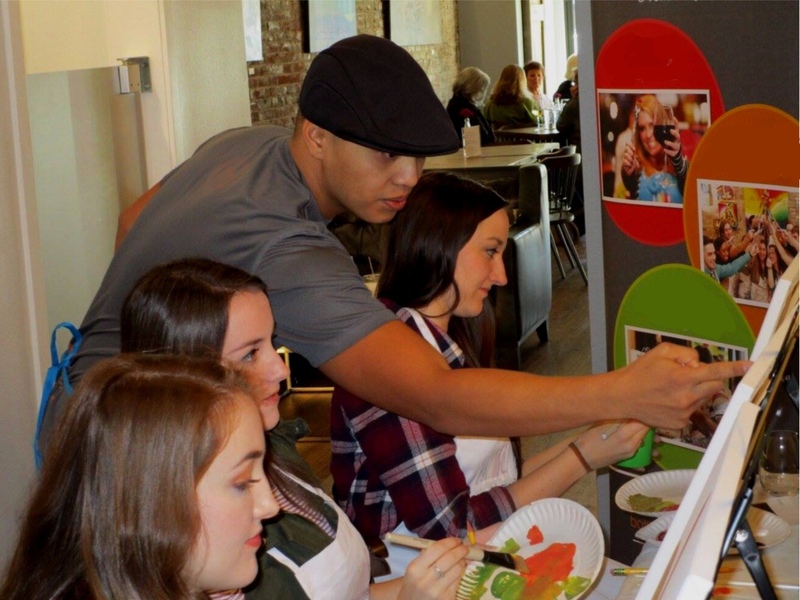 I have inspired students in their artistic endeavors by instructing them in many different ways suited to their style of learning (and or art making). 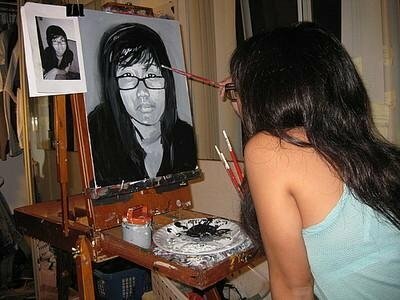 Together we have completed acrylic and oil paintings, numerous craft for projects, and drawings with charcoal. My teaching experience has been varied and I think I was able to hone a special kind of pedagogy in that way. 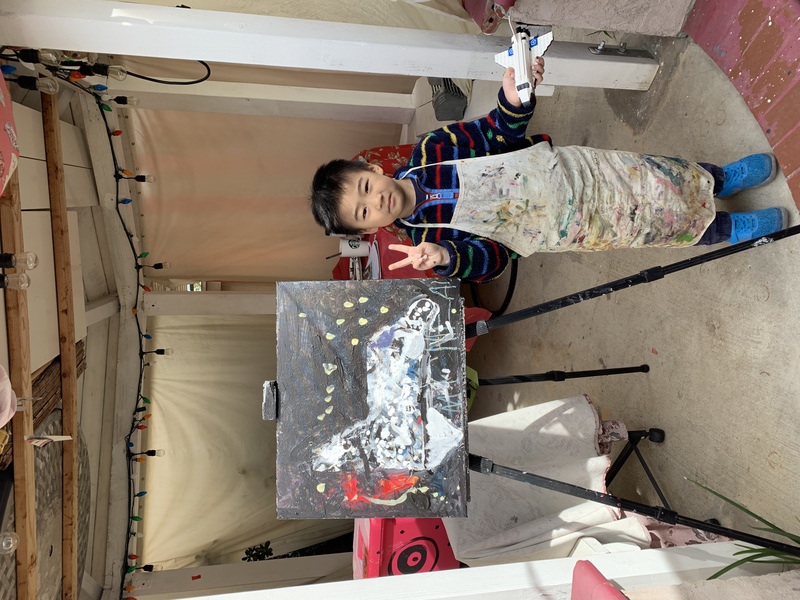 I have taught K-5th grade students for many years with many crafts projects and even gifted young students of that age who wanted to take their painting seriously and develop their artistic skills early. 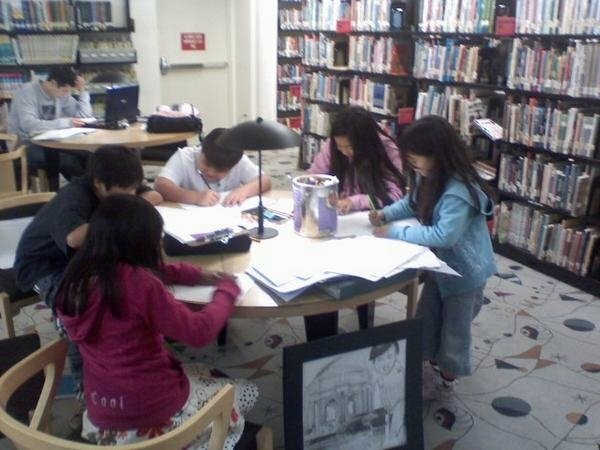 I volunteered at my local library to enhance my own skills of teaching and a way to give back to my own community of blooming young creatives. 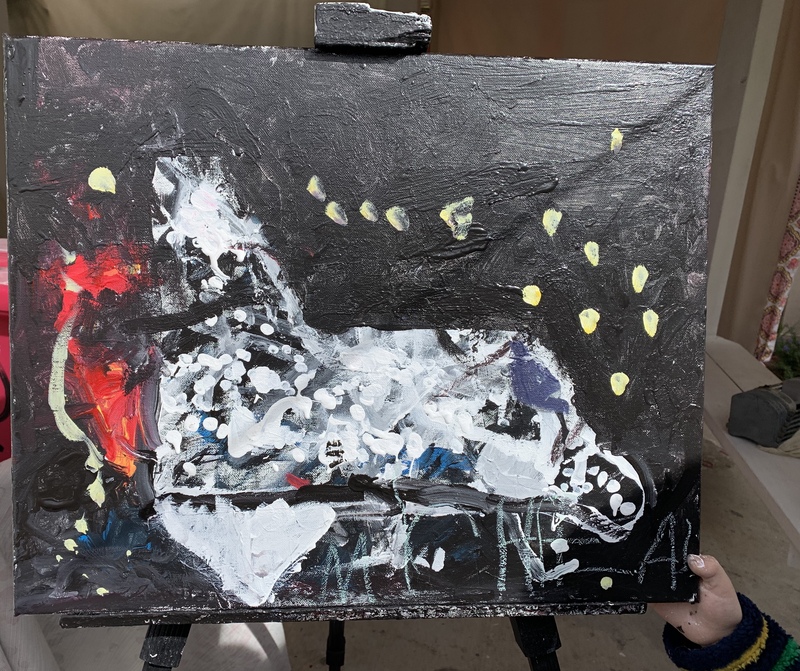 I have taught my peers techniques in oil during undergraduate school as I always had in mind to teach art as I was obtaining my Bachelor’s in Studio Arts and became a person that my classmates would come to frequently for help in their art projects. 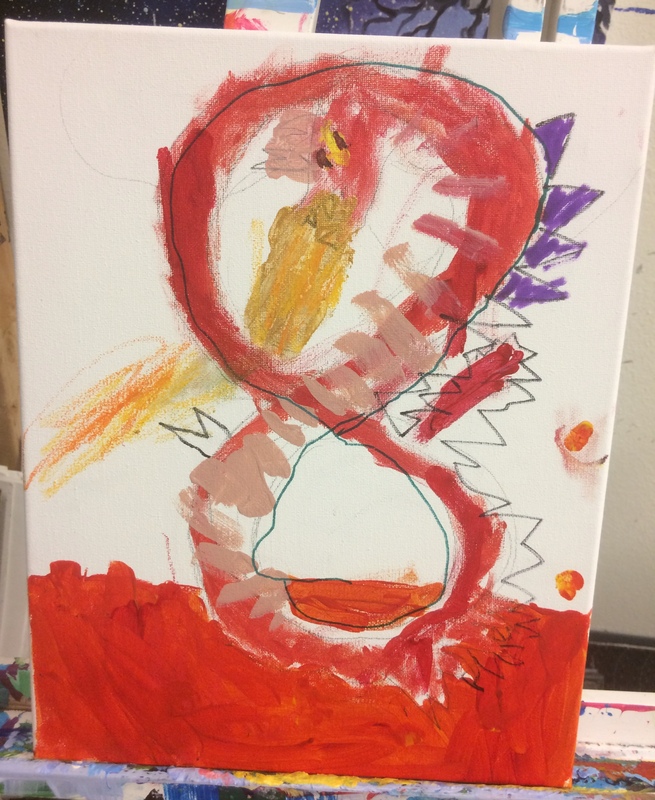 I had a job as a student aid at the student disabilities center where I aided a student with disabilities with her art projects. I was double majoring and was able to obtain some teaching courses as well such as gaining teaching experience at the Museum School (private elementary) and my old High school (Mira Mesa). Currently I teach privately and for certain jobs. All this experience has taught me to be able to observe learning styles of my students and to adjust my own teaching style to suit. 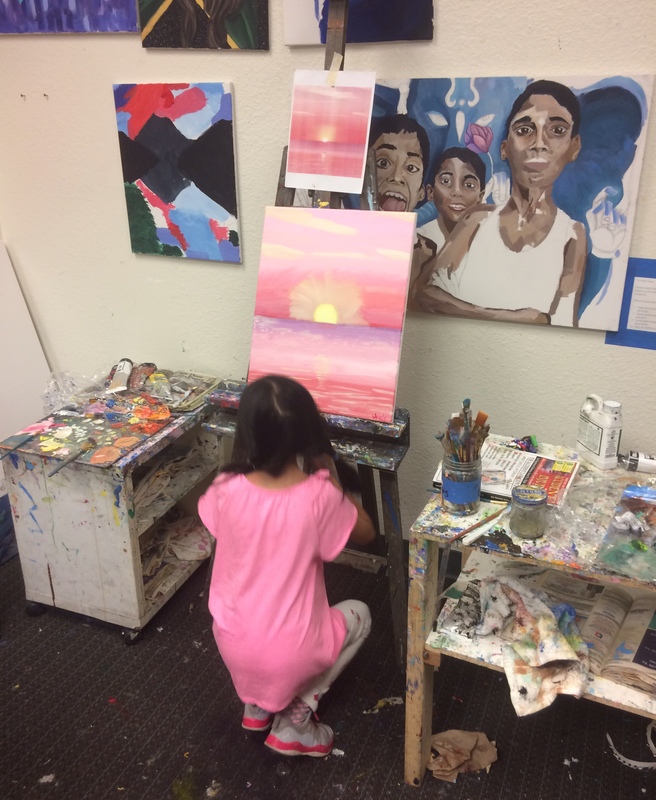 I don’t only have a specified way to teach technique, but I understand that art teaching is about enhancing the perception as well. I am very passionate about teaching art to my students and introducing them to a variety of art forms. 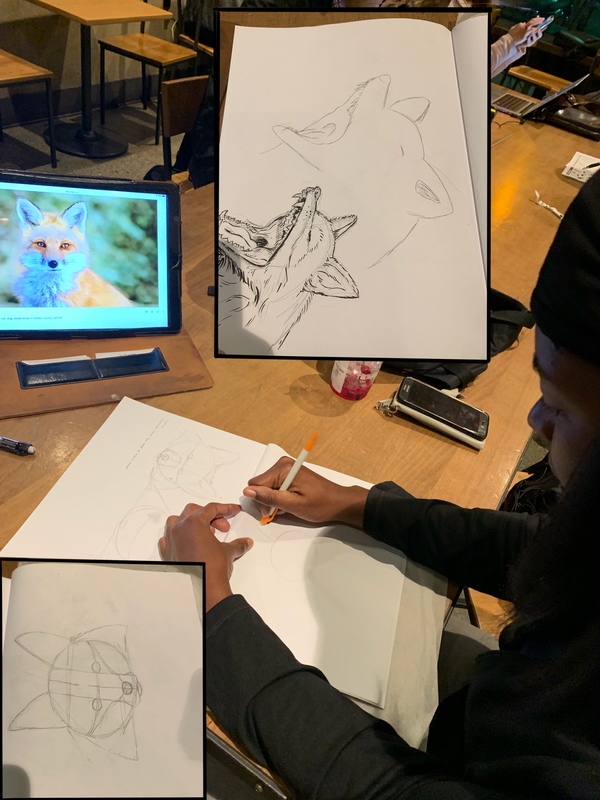 I love seeing the understanding and skill grow among my students and I bring not only knowledge and skill of my craft, but also motivational and organizational skills that are there for my students to gain self confidence in creating. ✍️My rate is $30 an hour for private lessons which includes us working on personal art goals and in depth skill building and instruction. This is for students that are serious about building their art skills and enhancing their understanding of visual arts. My students usually schedule 2 or 3 hours per class. 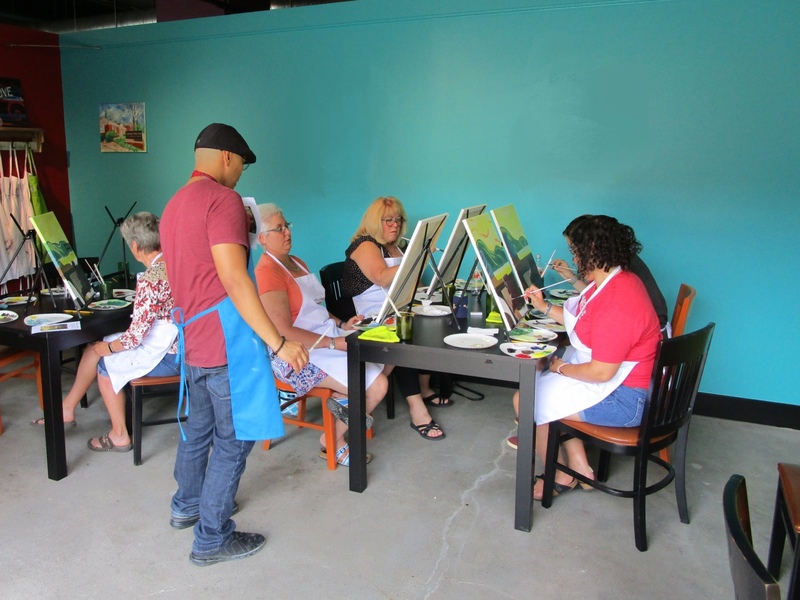 ✍️Tuesdays at 5:00-7:00pm I will start my group classes at $18.00 an hour (this is different from workshops). This is for students that are fine with being in a group and working on either group projects and individual pieces. ✍️First Wednesdays of the month at MM Library I will be teaching free *1 hour* intro class. 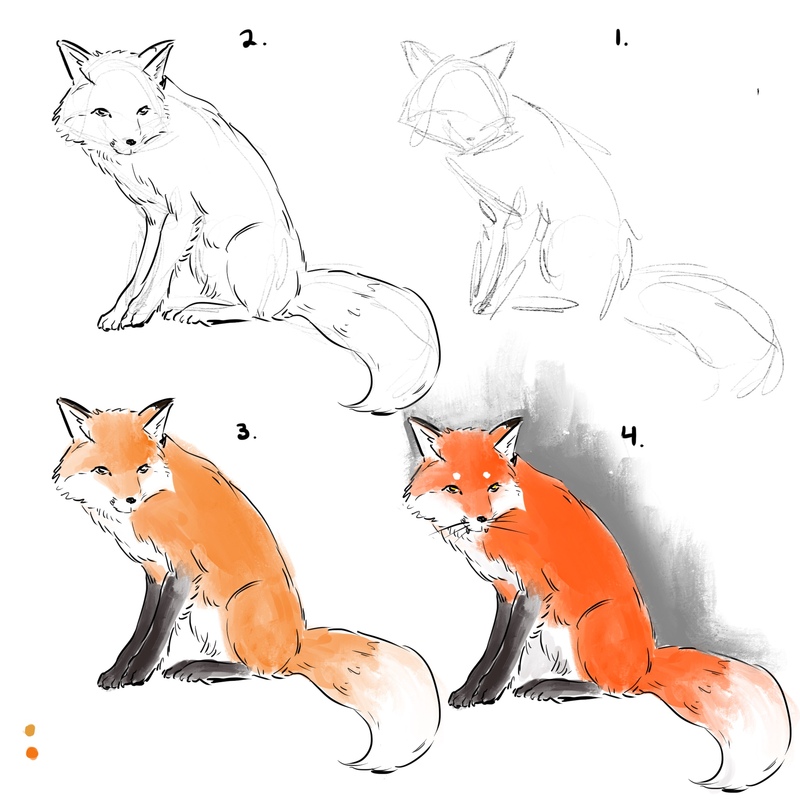 I will teach basic art technique and possibly do a guided drawing together. If interested please bring a sketchbook, pen or pencil, and prior work. I can critique work and we can discuss other artworks depending on the size of the group. This is an introduction and basics class. I have some exciting workshops I have planned so check again later! I also recommend this link for local art scholarships. I can’t wait to help with your artistic goals!